Our knowledge of the Gothic Bible in manuscript form rests on seven incomplete manuscripts (acc. to C. Falluomini's chapter in the new Status Quaestionis). In that chapter Falluomini comments: 'no new parts of the Gothic Bible have been found that would have attracted attention to this branch of the biblical tradition' (p. 331). So it is not every day we get new discoveries of portions of the Gothic Bible. 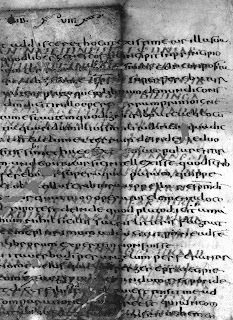 Hence it is exciting that a palimpsest bifolium has recently been discovered in Bologna (Italy), containing in its upper text a fragment of Augustine's De Civitate Dei, and in its under text new fragments of the Gothic Bible (I think excerpts from both OT and NT as part of a homily rather than continuous manuscript texts). They have been published as follows: Rosa Bianca FINAZZI and Paola TORNAGHI, 'Gothica Bononiensia: analisi linguistica e filologica di un nuovo documento' Aevum 87 (2013), 113-155. 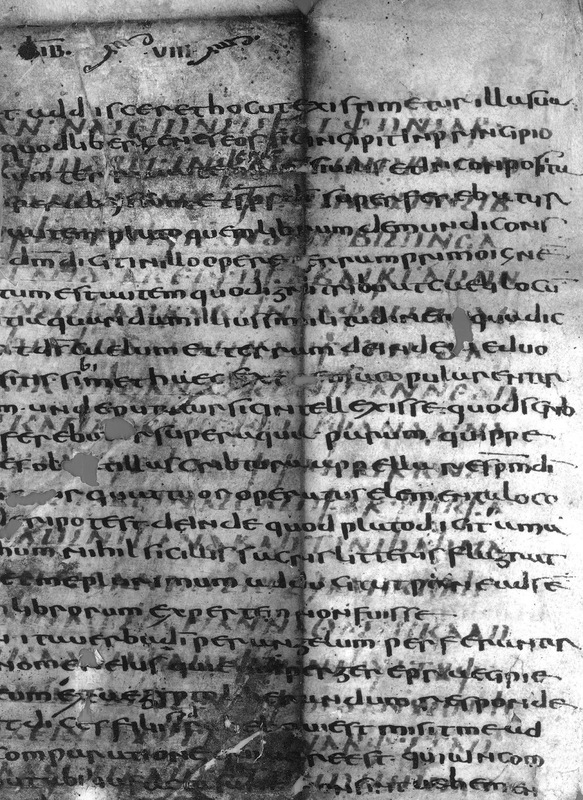 Abstract: Recently, in the Archive of San Petronio in Bologna, a palimpsest bifolium has been found out: the upper script contains St Augustine, De civitate Dei, in half-uncial; the lower script is Gothic, apparently written in Northern Italy. The Gothic lower script offers some passages translated into Gothic from the Old and the New Testament, which are up to now unknown and not handed down by the existing Gothic manuscript tradition. The Gothic text of the fragment has been transcribed; an Italian translation has been added. An in-depth linguistic and philological analysis is provided about the script, its origins and date, followed by the examination of the identified biblical passages being compared with the Greek and the Latin versions in order to highlight concurrences and divergences. This kind of analysis has casted new light on some traits of the Gothic language and its vocabulary bringing out terms that were not so far attested and rare terms as well. A summary and photos can be found here; thanks to Jean-Louis Simonet for the tip-off, who added: "it can be underlined that discoveries of Gothic Bible fragments are very rare, and that any improvement of our knowledge of this partially known Bible version is welcome, not only for textual criticism of the Bible, but also for Germanic philology!" Paul Anderson informs me that the Center for the Study and Preservation of the Majority Text has just published the 'Byzantine Greek New Testament: Family 35 Textform' at www.bgnt.net. The pace of publication of new GNTs is beginning to pick up. My review of Kostenberger and Kruger on The Heresy of Orthodoxy may also be interesting. There is a moral which could be drawn from these two contrasting pieces. On-line article by T. Finney, "How to Discover Textual Groups"
Tim Finney has made available an article on-line "How To Discover Textual Groups"
groups, identifies the most central member of each group, and identifies which numbers of groups are more natural for a data set. The MVA methods manage to identify many groups noticed by prior generations of scholars. One conclusion of the article is that Colwell and Tune's definition of a group (70% agreement plus 10% gap) should be abandoned.